Our Toyota Hilux is a 2010. 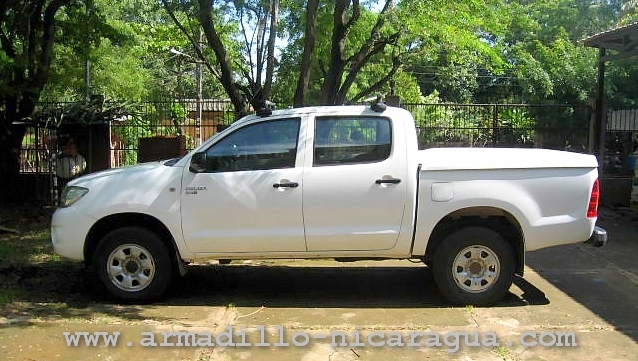 The Hilux is very versatile and extremely popular in Nicaragua. Give it a try and you will discover why that is. The version we offer has a 2.5 ltr 4-cylinder turbo diesel engine and a 5 speed manual transmission. The Toyota Hilux is not an AWD like our Suzuki Grand Vitara. 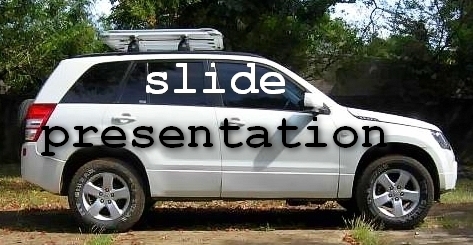 It comes with a floor stick that allows you to select between 2WD, 4WD-high and 4WD-low. When you are looking for an automatic transmission, then the Grand Vitara is your choice. Thanks to the type of transmission and the modern engine the fuel consumption of the Toyota Hilux is low. And, since diesel fuel is less expensive than gasoline in Nicaragua, you can save considerable money in comparison to other 4WDs. Also, the engine is remarkably silent and flexible. The ground clearance of the Toyota Hilux 4x4 is without any doubt very generous. This combined with the double traction and the type of tyres we equip it with, is it more than ready for serious off roading. At the same time it drives comfortably on highways as well. The height of the driver's seat can be adjusted. The airconditioning does an excellent job. Windows and mirrors are electric. This vehicle has a lot of places where you can store your open bottles or cans with drinks, so there is less chance of spillage.